Which decor you find beautiful? The Benedictine Monastery (established in 1234) was most influential in founding Buergel: "oppidum nominatum Burgelin", and remains one of the most important places of interest in Buergel. Mementos of those days are still in evidence, such as remnants of the old city wall which surrounded Buergel and the "Badertor" ("Bader Gate"). 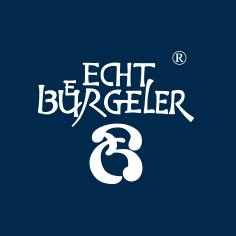 Although it is impossible to determine exactly when pottery making started in Buergel, authenticated evidence shows that in 1531 potters were working in Buergel. Rich supplies of clay and expansive sur- rounding	forests were ideal for the development of the potter's trade. In 1660, four of the largest potteries formed a guild. The potters' wives traveled and sold these wares throughout Thuringia and in the neighboring state of Hessen. 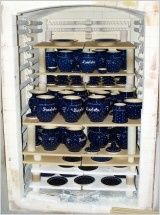 Kilns for firing stoneware were developed. In the mid 19th century the potters directed their ceramics in a more artistic direction. A school for ceramic design was founded, as well as the "Keramik Museum" (museum of ceramics). In the early 1920s the BAUHAUS influence can be seen in the Buergel Arts and Crafts ceramics. Typical modern Buergel pottery features the salt glaze, as well as the cobalt-blue glaze, and also the classic "Blau mit weissen Punkten" ("blue with white dots") pattern which originated in Buergel. 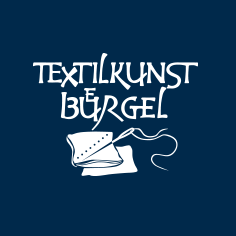 In Bürgel, the design of blue patterns goes back several centuries. Ever since the 18th century, it was customary to glaze the hard-fired stoneware with a special technique using a mix of salt and glass (see photo above). 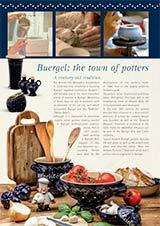 This irregu- lar, blue 'apron' has become a signature feature of the Bürgel stoneware. The blue tone stems from cobalt oxide, which is very temperature-resistant and which has proven to be an ideal pigment in the production of porcelain and ceramics. In view of the popularity of old, it is not surprising that tableware with the blue pattern was in demand for daily use. Nevertheless, when this began remains unknown. It is, however, believed that the blue pattern was applied to pots fired at a lower temperature at the end of the 19th century. Yet this does not refer to the blue gla- zes; the blue tones were achieved by im- mersing in, coating or painting with a liquidised, blue-coloured clay (see image above left). The potters refer to this as the Engobe technique: liquid clay is adhered to un- fired, dried clay - the coating or orna- mental painting is thereby on the unfired pot. The white dot pattern on a blue base can be documented back to Henry van de Velde. The Belgian art nouveau artist first visited the workshops in Bürgel in 1902, where he watched the potters carry out their craft. Subsequently, he designed new shapes for coffee and tea sets with a completely blue Engobe exterior that was adorned with white, sometimes mul- ticoloured, dot patterns (see photo above right). 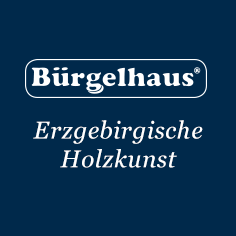 Since then, the pottery factories in Bürgel have revisited and altered the blue with white dots Engobe pattern again and again, combining it with different colours or experimenting with different shades of blue. In the 1970s and 80s, the Bürgel "blue-white' attained cult status as sought-after 'bottom-shelf goods'. This led to Bürgel gaining the reputation as the city of blue-white pottery. Today, the patterns have become more diverse again, but the 'blue with the white dot pattern' retains uninterrupted popularity.